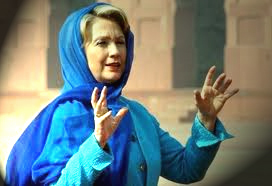 To replace the secular non-religions Gadhafi, Hillary Clinton has anointed the Muslim Mullah (religious leader) Mustafa Abdul Jalil, to be the next ruler of Libya. Mullah Mustafa Abdul Jalil proudly shows is commitment to Islam by the sacred callous, called a “prayer bump” in the middle of his forehead. The sacred “prayer bump” or “prayer scar,” also known as a zebibah (“raisin” in Arabic), is a mark on the forehead of a Muslim, due to five times a day contact of the forehead with the prayer mat or floor. Islam requires its adherents to pray five times a day. This involves kneeling and touching or even hitting the ground with one’s forehead. Muslims consider the prayer bump to be a sign of great piety. Many Muslims also believe that on the Day of Judgment, the sacred prayer bump will suddenly fluoresce an immense blinding white light. It would appear that Hillary is impressed by Abdul-Jalil’s fervent commitment to Islam. Abdul-Jalil, a religions name which means “Slave of the Majestic Allah,” graduated from the department of Shari’a Law in the Islamic Studies faculty at the Libyan University in 1975. He is an extreme advocate of Islam and Shari’a Law. 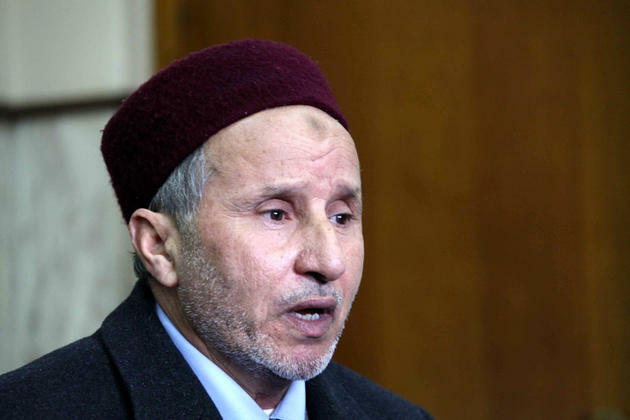 For a while, Abdul-Jalil was on the side of Gadhafi. From 2007 to as recently as this year, he was Minister of Justice in Gadhafi’s regime. However, Abdul-Jalil knows that the smart money is on Hillary, where he can use U. S. taxpayer money along with the military power of the U.S. and NATO to promote his radical brand of Islam and takeover of Libya. Supporters of the rebels led by Abdul Jalil are eager to exact their own Islamic revenge on Gadhafi and his regime by the Sword of Islam (and we all know what that means). Thanks to U. S. Secretary of State, Hillary Clinton, radical Islamist Abdul Jalil is now America’s man in Libya. The Mullahs in Iran are gonna love this guy! unforgivably you are completely misinformed. and your problem is that you believe you know something or two about Islam, Libya, Arab, or even politics while you know Nada. I suggest you first know what Islam is all about, read a bit about the Libyan history, and people, and not just the modern history but the struggle against Italy and Jihad in Libya, then lets talk what is extreme and not extreme. Libya and north Africa in general were one of the Islamic countries that are mainly Sunni, and within the Sunni methodology follow mainly Malki method in implementing Shariha, offering very less room for dispute and extreme ideas. the only extremism found in Libya was because of the unjust environment created by Gadhafi and he was a good allay to the west UK, US, France, and Italy. the west chose Mustafa because we have chosen him, and they have no way around it. for US interests Gadhafi was ok, and was working well for them and other western countries. however that does not work any more. Marhaba! Not quite, sadiqui. I lived for nine years in Saudi Arabia, and for a short time in Kuwait. And I do know what Islam is all about. Since my Arabic is not great, (basically Jeddah street Arabic) I rely heavily on my A. Yusuf Ali translation of the Koran — which I have read and reread many times and which is placed at the highest position on my bookshelf. (I pay no attention to the Hadith.) I speak Italian fluently have lived in Italy and am intimately familiar with the Italian presence in Libya. If you look at my right sidebar, I have repeated a critical remark regarding the friendship of Senator McCain and other U.S. Senators during their visit to Gadhafi. For them Gadhafi was a good allie of the West. I am not quite sure he was. One of the reasons for the US/Nato backing of the revolution was that much of Gadhafi’s oil was going to China, and there was a growing Chinese presence in Libya. The U.S. wants China out of Africa and that includes Libya. My personal opinion is that Libya deserves a more modern leader than Mustafa as he was a Gadhafi man for many years. Let us all hope that Libya’s transition goes well. thanks for the Mabrook, as we really deserve it. and good to know you are an open minded person who is trying to understand the other side. Mustafa is a modest man, and all who knew him will tell you just that. his aim is not to rule, his aim is set the correct righteous base to start an national debate/dialogue to build civil, political, and humanitarian systems in a country that the only system was the mobs of Gadhafis and his sons rules/policies if there were any at all. May this holy night bring peace and prosperity to Libya, to you, and your country, and to the whole world.